Monarflex s.r.o, part of the ICOPAL GROUP, is Europe’s leading manufacturer of Polyethylene reinforced and non-rein-forced sheeting and membranes and for the past 40 years Monarflex has been very well known as an active and reliable producer of high-quality products to International Aid Organisations, NGO’s and various UN Agencies. Monarflex has manufacturing plants in Slovakia. Our prime objective is to provide a total solution for our customers and therefore we are not just a supplier of plastic sheeting, but rather a full solution provider. At Monarflex we use our many years of experience to invent and engineer thrilling new products employing the latest plastic technology. 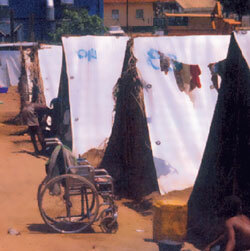 Our world aid products include tarpaulins (sheeting) used as tents or other temporary coverage purposes as well as squatting plates, enabling the establishment of good sanitary conditions for example in refugee camps. Water Bowl for Large Squatting plate. We always keep a stock of the well known Monarflex Squatting Plate, which enables us to respond swiftly to emergencies. We are generally able to respond within 24 hours after a major emergency. Through our co-operation with leading freight forwarders, we are able to offer direct deliveries to most destinations world wide by container or truck.